Chris Krafcik and Chris Grove from Eilers & Krejcik Gaming analyze the latest market and policy movements across the regulated U.S. sports betting landscape. The regulated U.S. sports betting market generated handle of $890.89mm for the month of February, which was down 10.05% on January’s haul of $990.43mm. The decline in handle was largely attributable to the shortened calendar (February had three fewer days than January) and to seasonal factors. Super Bowl betting, which helped prop up volumes in January, slowed in February. Across the country, volumes should meaningfully rebound in March – driven by NBA and NCAA basketball wagering – before slowing again during the April-August period, when the professional and collegiate sports calendar is far less busy. In February, as in previous months, Nevada and New Jersey accounted for the lion’s share – or about 88% – of total regulated U.S. sports betting handle. Notably, New Jersey, where online (PC + mobile) sports betting accounted for more than three quarters of total statewide handle in February, generated approximately 37% of total regulated U.S. sports betting handle in February. In the bellwether market of New Jersey, the daily fantasy sports tandem of DraftKings and FanDuel have been – and, in February, continued to be – the top performers in terms of online sports betting revenue. 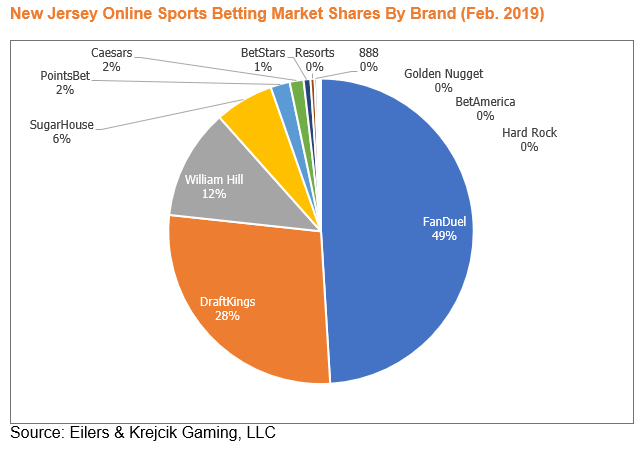 Indeed, the two brands boasted a 77% share of the New Jersey online sports betting market in February, according to our proprietary estimates. For perspective, the two have had market share of about 82% since launch (in August 2018). Their success, we believe, has been driven in no small part by cross-sell. In March, Paddy Power Betfair noted in its CY18 results that approximately 50% of its New Jersey sports betting customers were acquired via the company’s FanDuel DFS channel. We also understand that DraftKings and FanDuel, which operate online casino offerings in New Jersey (under the DraftKings and Betfair brands, respectively), continue to benefit from reverse cross-sell – that is, from online casino to online sports betting – and that online casino spend per player has been relatively unimpacted. The Atlantic City casino industry is struggling for traction in New Jersey’s fast-growing online sports betting market. On a trailing-three month basis, casinos have collectively accumulated online market share of less than 2% (in revenue terms), according to our tracking. Absent a major strategic change, it’s clear that the casinos will effectively cede the online market – which we think could exceed $400mm in annual revenue, once mature ­– to non-endemic brands like DraftKings, FanDuel, and William Hill. The casinos’ seeming disinterest in the New Jersey online sports betting opportunity also makes us wonder: Is DraftKings and FanDuel’s collective overperformance in New Jersey being driven as much by their aggressive posture as by the casinos’ underperformance? This year, governors in a handful of states are pitching sports betting as a source of fiscal stimulus. In Illinois, for example, Governor J.B. Pritzker (D) has said he wants to tax sports betting gross gaming revenue at 20% and issue 20 online sports betting licenses – each with a $10mm fee – to help fill a $3.2bn budget hole. Sports betting tie-ins with state budgets are clearly a case of Be Careful What You Wish For. Budget bills create a path – expedited but expensive – for sports betting expansion. But we wonder whether sports betting, which already enjoys a relatively high level of political salability in the U.S., really needs that path. We expect that gambling stakeholders in Illinois (and other states) will be working to frame sports betting not as a fiscal panacea, but as a source of incremental new state revenue. Some will assuredly point to Pennsylvania, where that state’s high-tax, high-fee approach to sports betting regulation has dampened casino-level interest in sports betting expansion. States south of the Mason-Dixon line – most of which have very limited regulated gambling markets – have surprisingly been among the most leading-edge in terms of proposed sports betting policies. Take Georgia. A now-dormant bill would have created an online-only market regulated by the Georgia Lottery. There would have been an open, competitive bidding process for 10 online sports betting licenses, and each license would have come with three skins. Online sports betting gross gaming revenue, moreover, would have been taxed at a reasonable 10% rate. Although we aren’t exactly sure why southern states are pushing the envelope, we assume the all-comers online licensing models that have emerged in Georgia and Tennessee, for instance, are the product of organic lawmaker interest and lobbying by the commercial casino and fantasy sports sectors. As the national sports betting debate matures, we wonder whether southern states – none of which are odds-on for sports betting expansion in 2019 – will continue on this progressive trajectory or regress to their more conservative mean.